Two small but critical additions to the new iOS 9 betas released on Thursday include "Wi-Fi Assist," a feature built to prevent iPhones from latching onto poor Wi-Fi connections, and Wi-Fi calling for AT&T network customers. 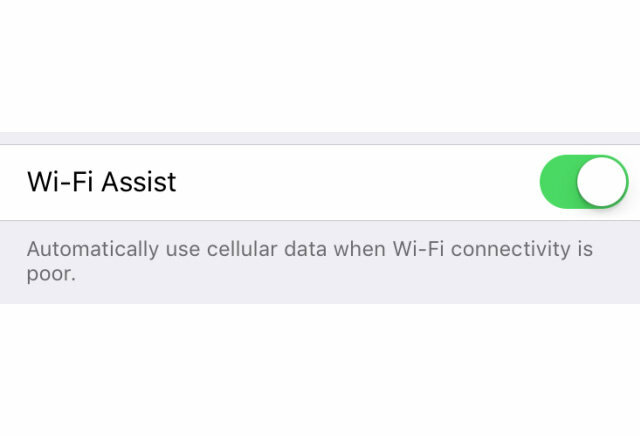 Despite its name, the new "Wi-Fi Assist" option can be found under the "Cellular" menu in the iOS Settings app. Turning it on will force a device to switch to a 3G or 4G connection when a Wi-Fi signal falls under an unspecified quality level. Currently an iPhone will often attempt to connect to a known Wi-Fi hotspot even when it's barely within range, even if the connection is too weak to effectively transmit data. Until iOS 9 beta, the only viable solution in such circumstances has been to disable an iPhone's Wi-Fi radio. Accordingly, Apple has also made it clearer when Wi-Fi is being turned off. The icon now turns "inactive" gray before one of the symbols for cellular data appears. On a related note, the latest iOS 9 beta also enables Wi-Fi calling for AT&T subscribers. Offloading incoming and outgoing calls to a local wireless network offers a more reliable connection, enhanced audio quality and better battery performance. Apple first activated Wi-Fi calling features for T-Mobile's network with an early iOS 8 beta last year. Apple released two new iOS 9 betas earlier today, including a third public beta and a fifth developer seed. Both are effectively identical, but the company is slower to issue public betas in order to avoid causing too much aggravation with bugs or poor performance.